This THREE DAY course is designed to give the qualified diver a taste of what more specialized diving activities have to offer, whilst building your diving experience and confidence. Navigation and deep are a requirement and you can choose 3 other dives that interest you. After completion of this course, you will be able to dive to a maximum depth of 30m. If you do not have time to do the full course, but still want to dive PROTEA BANKS, we can do it as an Adventures in Deep dive. This is basically the first dive of your PADI Advanced Course and can count towards your PADI Advanced Course later on. You will do the knowledge review for the deep dive and dive with an Instructor. The cost of this dive is R1400-00 per adventure dive and includes your Instructor, dive and use of equipment. The course takes place on one of the top shark and gamefish dives in the world, PROTEA BANKS. Get credit! Each Adventure Dive in the PADI Advanced Open Water Course may be credited toward the first dive of the corresponding PADI Speciality Courses. In the PADI Advanced Open Water Course you will use basic scuba gear, as well as get the chance to use a dive computer and compass. The use of equipment will be provided by Aqua Planet Dive Centre and Charter, for the duration of the course. The PADI Adventures In Diving manual. This is provided in the course fee. To enrol in the PADI Advanced Open Water Course, you must be a PADI Open Water Diver (or have a similar qualifying certification from another training organization). To enrol in the PADI Advanced Open Water Course, you must be at least 15 years old. To enrol in the PADI Junior Advanced Open Water Course, you must be at least 12 years old and are limited to a maximum depth of 21m. 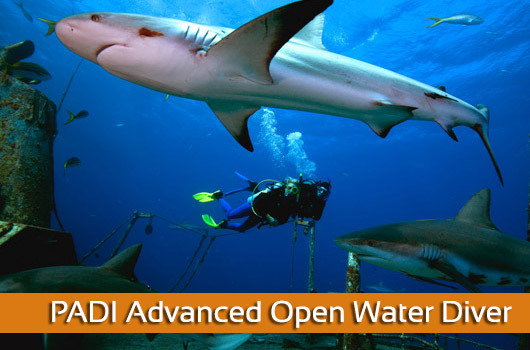 PADI Advanced Open Water Course: R4800-00 per person. PADI Advanced Open Water Course (replace a reef dive with a Baited Shark Dive): R5500-00 per person. If you are looking for more adventure and knowledge, your next step is the PADI Rescue Course or PADI Speciality Courses.